BANGKOK, May 5, 2010 (AFP) - Thailand's anti-government "Red Shirts" hinted Wednesday their weeks-long rally in the heart of Bangkok could soon end as they awaited more details on the government's reconciliation roadmap. Despite signs the crisis is nearing a resolution, thousands of protesters remained barricaded inside their encampment in Bangkok's main shopping district, behind piles of tyres, razor wire and bamboo stakes. The red-clad demonstrators, whose eight-week campaign has sparked deadly outbreaks of civil unrest that have left 27 dead, agreed Tuesday to join Prime Minister Abhisit Vejjajiva's proposed reconciliation process. The mainly poor and working class Reds want Abhisit to make clear when he will dissolve parliament for elections promised for November, and to withdraw troops who have converged on the capital, which is under a state of emergency. But Reds leader Veera Musikapong voiced optimism Wednesday that the end was in sight for supporters who have spent weeks sleeping rough under flimsy shelters, and who are now enduring the start of the rainy season. "I have a feeling that we will soon return to our hometown as our goal to fight for true democracy and return power to the people is about to be achieved," Veera told the crowd. "We have been together for some 50 days, I really feel that we may soon return home," he said as leaders of the movement offered alms to 45 Buddhist monks on their protest stage. 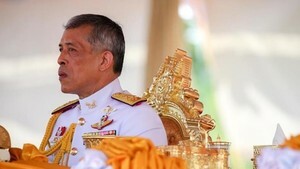 The ceremony was part of celebrations for Coronation Day, which marks the 60th anniversary of the official coronation of King Bhumibol Adulyadej, the world's longest-reigning monarch. In a light-hearted address to the crowd, Veera said the protesters would not remain forever in Bangkok's retail heartland, where luxury hotels and shopping malls have been forced to close. "We will not stay here until we obtain the land title deed," he joked. Abhisit said in a nationally televised address Monday that he was ready to hold elections on November 14 if all parties accepted his reconciliation plan, and drop their demand for snap polls. But the Reds said they would continue the rally until the premier spells out when he will dissolve parliament, and said he should leave it to the Election Commission to set the poll date. Many of the protesters support fugitive ex-premier Thaksin Shinawatra and say Abhisit's rise to power on the back of a court ruling in 2008 that ousted Thaksin's allies was undemocratic. The telecoms tycoon-turned-politician, who was toppled in a 2006 coup and now lives overseas to avoid a jail term for corruption, has called for the two sides to settle their differences. "Reconciliation is good for everybody," he said in a phone-in to a meeting of the opposition Puea Thai Party on Tuesday. "Don't think about the past but look to the future." Arrest warrants have been issued for many leading Red Shirts, who are defying a ban on rallies in the capital, but the authorities are ready to discuss an amnesty for protest leaders, according to a government source. The Reds have said the government is intent on clinging to power until September, when an important military reshuffle will take place and the national budget will be approved in parliament. The government, which was appointed with the backing of the military in a 2008 parliamentary vote, wants to ensure the new army leadership line-up is appointed before it goes to the polls. Observers say that when Abhisit does face the people, his failure to connect with the rural masses means he will have a tough battle against the pro-Thaksin forces that have won every election for a decade.